All modern vehicles have an Engine Control Unit (ECU) which is a small computer which runs the engine, controls ignition timing, air/fuel mixture and puts various limits on speed and revs. These features are displayed as a 'map' and can be modified through a process known as ECU remapping. ECU remapping will give you better performance from your engine, increased torque and greater fuel efficiency. Both rev range and throttle response will be improved and you will be able to enjoy a smoother and more responsive drive. We are able to carry out a full range of bench remaps along with OBD maps. When a manufacturer builds a new car they will take into consideration all of the conditions it may be subjected to in the countries they intend to sell the model. This means that the ECU unit will be configured to fit environmental and political factors such as climate, fuel quality and emissions and, as a consequence, the overall vehicle performance is compromised and not as good as it was originally intended to be. ECU remapping is a service that allows these parameters to be reconfigured, within safe and legal limits, so that the optimum performance of the vehicle can be achieved. This means the engine power, torque ability and fuel economy will be improved significantly. Therefore you could potentially benefit from as much as 35% more power, 35% more torque, better driveability, a quieter, smoother and more responsive drive as well as up to 15% fuel saving. Our re-mapping process enhances and optimises the performance of your vehicle. This extra power means fewer gear changes, which means less wear and tear and an extended life for your vehicle. At Cross Motor Engineering we will customise the ECU tuning process to your vehicle, whether it’s petrol or diesel we will configure the process accordingly. We have more than 30 years of experience in the car tuning industry and we have kept up to speed with all the latest processes and technology. We know what it takes to ECU remap your vehicle so that you can enjoy the best performance so please get in touch to discuss your requirements. We are able to analyse the optimum settings for the make and model of your vehicle and ensure that when your vehicle is tuned, you benefit from all the improved performance measures that your vehicle should deliver. 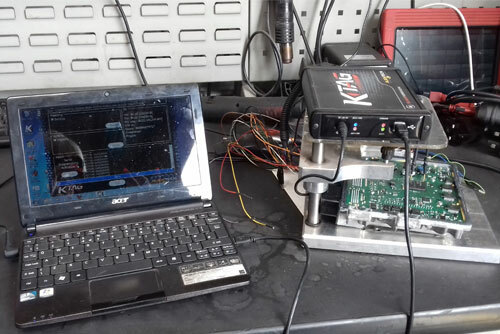 Cross Motor Engineering have invested in all the equipment necessary to remap vehicles incorporating all aspects of ECU removal and modification. We provide ECU remapping for all makes and models of vehicles including prestige vehicles so if you are looking for greater performance from your vehicle at a cost effective price, please contact us now and speak to one of our specialist team. We will guarantee to boost your fuel efficiency achieving more miles per gallon, plus better overall performance.